Espais i Acrobàcia, S.L., founded in 1991, is pioneer in rigging works in Spain. It’s a specialized, experienced company in all the chances this activity brings: concerts, exhibitions, advertising, cinema, television, private events, sports, and so on. Its Manager and founder, Toni Garcia, has been linked with rigging since 1979, working in all kind of projects. A professional attitude, the client’s needs satisfying and safety are all present maxims in our works. Espais i Acrobàcia materials are technologically leading, and have the CE certifications complying with the maximum guarantees of quality and safety, with rigging materials available for 3,000 rigging points, 600 Yale manual hoists, 200 CM electric motors, computerized elevation system, 3,000 m of truss structure (Prolyte H30V and Tomcat MD Studio). We develop suitable projects for the customer, after studying its feasibility, bringing qualified staff, technical advice, logistics and the proper materials. Our rigging works have the certified form the Official Architect Association. We offer supply of the main worldwide brands in rigging materials, after studying the particular client’s needs, and the specific training for the different jobs related to rigging as well. - Barcelona Teatre Musical (BTM): Structure development for the conversion of the arena into theatre, under proposal of Focus, S.A.
- Auditori de Barcelona: Rooms motorization – elevation systems. 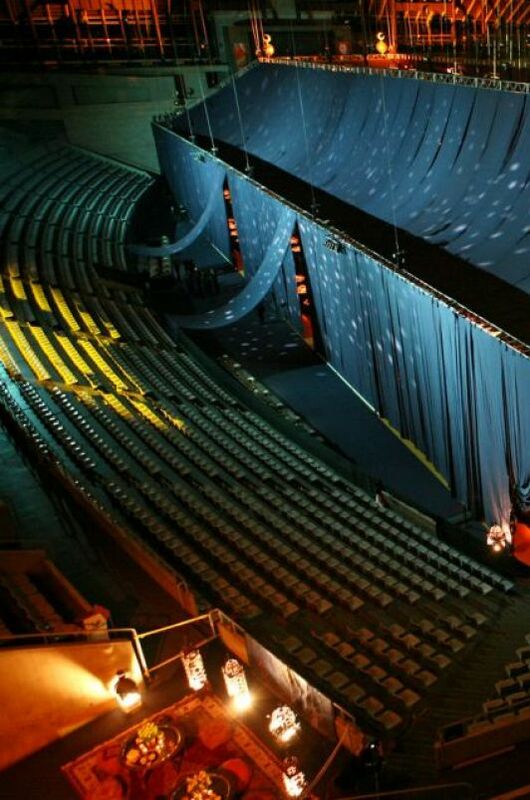 - Palau Sant Jordi Arena: Installation of computerized dividing curtains system. - Sant Jordi Club: Installation of truss grid and acoustic curtains.
. Opening and Closure Event Show of the Barcelona’92 Olympic Gmes, Paralympic Games and Special Olympics.
. Worldwide Audi A3 coming out show (rigging and local production company for G&D Event Marketing Partner) in 1996.
. Pepsiclope: Pepsi new can coming out show in 1996.
. Architecture Awards show in the Barcelona’s Torre de Calatrava – La Fura dels Baus show in 1996.
. Mercedes A-class European Coming out Tour (rigging and stunts – La Fura dels Baus) in 1997.
. FNAC stores opening shows in Barcelona.
. Concert de Focs in Maria Cristina Av for Project in 1998, 1999 and 2000.
. A.I.D.S. International Congress in Barcelona (for ACS Audiovisual) in 2002.
. International Congress in Cardiology in several editions.
. NBA European Tours in several arenas all around Spain and several editions (for Canal Plus).
. ACB League of Basketball broadcasting (for Canal Plus).
. Swimming World Championship in Barcelona (for Focus) in 2003.
. Basketball Final Four in Palau Sant Jordi in 2003.
. Mango annual Event in Palau Sant Jordi in several editions.
. Tech-Ed Microsoft Congress in Fira de Barcelona (for PCI Fitch-Live) in 2001, 2002 and 2003 editions.
. Microsoft Party in Palau Sant Jordi (for PCI Fitch-Live).
. Laureus Sports Awards show in Barcelona in 2006.
. GSMA Awards & Summit in Barcelona (for White Space Productions) in 2007, 2008 and 2009 editions. Bryan Adams, Paul McCartney, U2, Bruce Springsteen, Bon Jovi, Massive Attack, Tom Jones, Open Road Tour Harley Davidson, The Rolling Stones, Santana, BAM, Bunbury, Deep Purple, Christina Aguilera, Robbie Williams, Ben Harper, Concierto Movistar, Van Morrison, Serrat, The Strokes, AC/DC, Eric Clapton, Oasis, Mike Oldfield, Marylin Manson, Rage Against the Machine, Roxette, UB40, The Cranberries, Coldplay, Peter Gabriel, Iron Maiden, Madonna, Muse, Franco de Vita, Pink Floyd, Franz Ferdinand, Queen, Depeche Mode, Elton John, Il Divo, Juanes, Marc Anthony, The Killers, The Prodigy, Metallica, Australian Pink Floyd, Kiss, Alicia Keys, Aerosmith, Jamie Cullum, Rihanna, George Michael, Sting, Shakira, Lady Gaga, Kylie Minogue, Arcade Fire, The Black Eyed Peas, and many others. Peter Pan, Gaudí, Notre-Dame of Paris, Mamma Mia, The Beauty and the Beast (in the Barcelona Teatre Musical).
. Cirque du Soleil shows: Delirium, Saltimbanco, Alegria (for GAMERCO – LIVENATION).